When employment is concentrated in a small number of large businesses, the closure of a single business can have a significant impact on the local economy. Businesses employing more than 500 people – large businesses – represent about half the state’s employment, but only about 42 percent of employment in the Mountain Resources Commission (MRC) region. Conversely, this illustrates the relative importance of small businesses in the MRC region. Wilkes and McDowell Counties have the highest percentage of employment at businesses with more than 500 employees, at 57 percent and 54 percent, respectively. 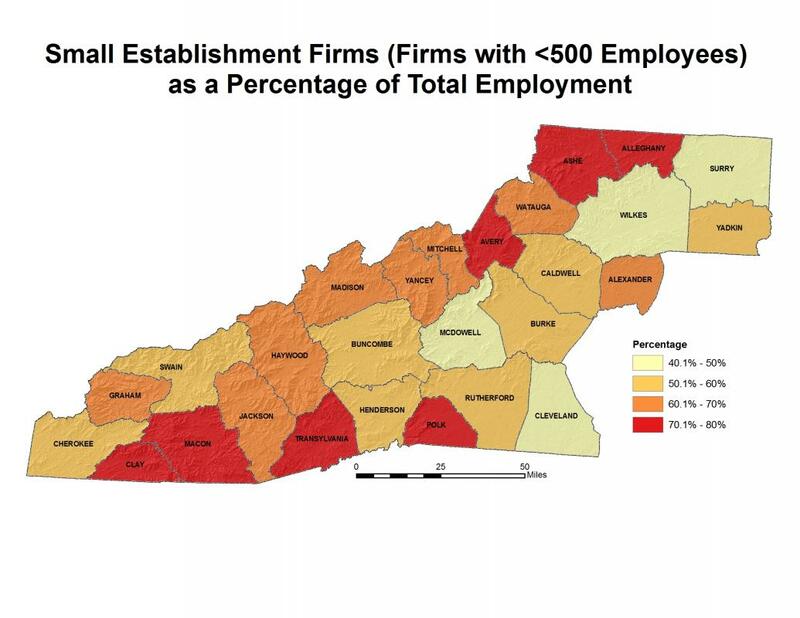 Small businesses represent more than 75 percent of employment in four MRC region counties – Avery, Macon, Clay, and Alleghany. Employees of large businesses tend to earn more money that those in small businesses. Pay at large businesses is 32 percent higher than at small businesses statewide, but only 20 percent higher in the MRC region. Between 2000 and 2008, the number of firms in the MRC region with more than 500 employees increased 2.6 percent, while the total number of firms increased more than 7 percent. 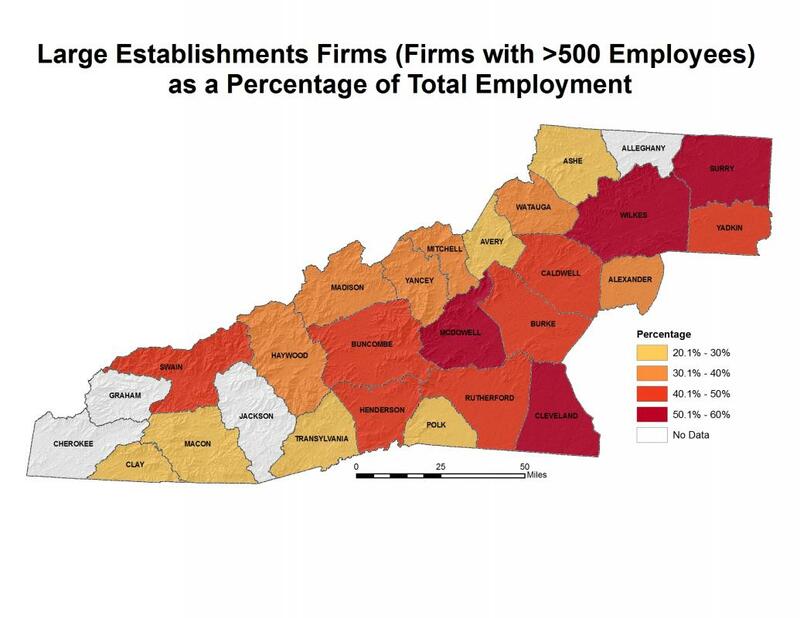 The highest percentage increase in the number of large firms between 2000 and 2008 was 42.3 percent in Yancey County, while Henderson County had the largest increase by number with 35 more large firms in 2008 than 2000 – 53 percent of the region’s total increase in large firms. Small businesses, as defined by those having less than 10 employees, accounted for 11 percent of all businesses in the region in 2009. There are considerable differences in relative contribution of small businesses across the region. The greatest concentrations of small businesses are found in the far western counties of Macon (15 percent), Graham (14 percent), and Swain (14 percent). The lowest concentrations are in Polk (8 percent), Madison (9 percent), and Transylvania (9 percent) counties.